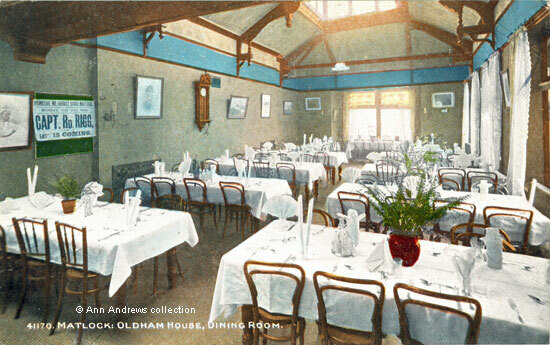 The dining room was built in 1899 as part of extensive alterations to the newly amalgamated Prospect Place and Oldham House Hydro (Prospect Place had been bought that year). The architect was Mr. Davis Mark Wildgoose, son of the owner. The room measured 47 feet by 20 and during the Christmas festivities of that year it was used as both a concert hall and ballroom. The card's sender wrote: "You will see by this it is rather a large Dining Room. I think you would like Matlock. It is a very pretty place". The year the picture was taken is provided by a poster on the dining room's notice board. It was advertising the fact that Captain Rd. Rigg would be coming to the town on Monday February 10th 1908 as part of the Primitive Methodist scene. He was an ardent temperance reformer when first elected in 1900 as the M.P. for North Lonsdale (Appleby), at the age of 23. In his first two years as an MP he apparently remained silent in the House of Commons, but his local popularity was said to be beyond doubt, thanks to his involvement in the temperance movement and the freemasons and his support of football in Westmorland. It is not known how his visit to Matlock was received. The Vernon Lamb Archive, Hydros and Convalescing, Index has 15 photos of the hydro's staff and guests. "Matlock: Oldham House Dining Room". Published by The Photochrom Co. Ltd., London and Detroit, U.S.A., No.41140. Photo Colour Series. Posted on 15 May 1910 at Matlock. "Derbyshire Times", 3 January 1900. Report of the Christmas festivities. "Derbyshire Times", 8 April 1905. Rigg was described as "a square-jawed young man, with dark hair cut fashionably short and neat moustache befitting a captain in the Volunteer militia".